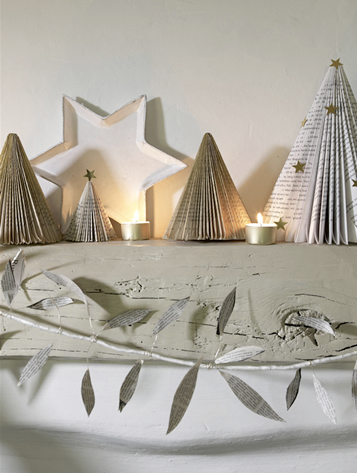 Recycling the pages of books for adorable trees and garlands (I have to find a DIY for this one!).. 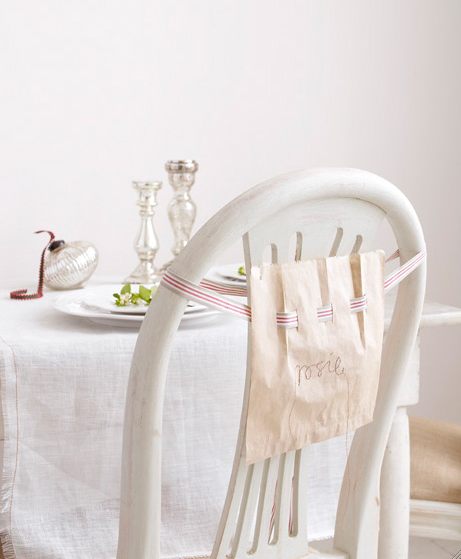 And since I am not going to be in my house for Christmas I am always looking for tree options that don't shed and think this one if perfectly darling..
And lastly I love this cute option for holiday table placecards...and you could even put little treats or a favor inside the bag. Hope you all have a lovely evening! I had to laugh - I was JUST looking at my blog roll line up and it looks like 90% of my December posts are going to be holiday related. Needless to say, I'm quite enthused to see more of what you have up your sleeves and in your "favourite" folders. These options are so lovely, Blair - both simple and unique. If you find a DIY for those paper trees please let me know! They're adorable. That stick tree is really cool. I just love Christmas decorations! I love the bulbs in the fireplace! I have to try that! All beautiful! 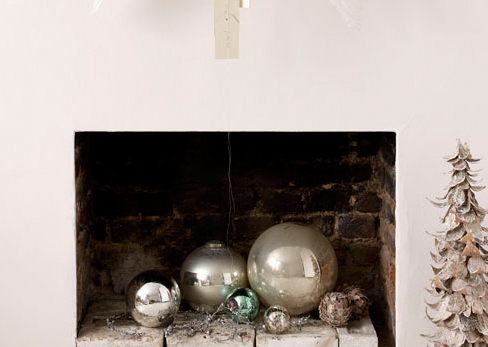 And I love the glass bulbs in the fireplace, although I use mine too much for this to be practical. Gorgeous colors in all! That first image is just perfect!! 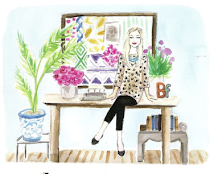 My blog will be mirroring yours, with holiday decor and wish lists. I have been saving and can't wait to share! great post, keep them coming! inspiration is awesome!! Love the use of recycled paper! I use my old design magazines to make paper pottery. Hope you will take a look via @blue_drift on twitter. Will post latest pic soon. Love the holiday posts! 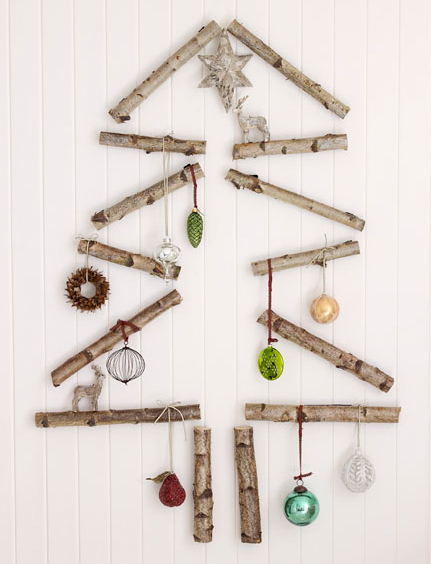 Ohhh, love the branch, wall Christmas tree. Super fun. and i'm SURE i have that DIY for the book trees in my old mags somewhere. i'll see if i can find it! Why sort through old mags when i can just google it?! how does this look? I love this more soothing, natural interpretation of holiday decorating! i love holiday decor! although my house screams christmas, i love the subtleness of these images. so pretty. that tree is such a good idea too. All is lovely and really inspiring! I love the book trees! How special would it be to use a favorite book...a classic or child's fav? !!!!! Great idea for large Mercury balls! Thank you so much. Look forward to Dec posts. How cute is that tree made out of the sticks? I love that! no warning needed, sounds good to me! Funny you should mention that your December posts will mainly consist of Christmas decor because mine will be the same. I have allotted about 80% of my posts to Christmas decor, ideas, DIYs and a tonne of other stuff. Great post, Blair. I love how simple and unique these idea are. My favourites are the ornaments placed in the fireplace and that cute wooden tree! these are fabulous and I love the Christmas-themed posts! Whee- best time of year! I'm totally on board with this whole "Simple Christmas" trend that's been going around. I so hate the stressful hustle and bustle of the holidays. I aim to take more time to enjoy the things that make this time of year truly great. More hot cocoa, more lights, more gingerbread cookies, soft sweaters, and reading by the cozy fireplace- LESS stress. Great post. i saw this today and thought of you. Hi, I found you through the Times blog list - glad I did! Those book trees were featured in last year's Christmas issue of UK House & Garden. Happy to dig it out, but I think the basic idea was to tear out the first 30 pages, inc spine, on each page fold the top edge down to meet the bound edge and then fold the triangular overhang at the bottom up. Take another 30 page section of the book and repeat, then attach the two halves together. Does that make sense...?! I was meaning to do it this year but haven't got round to it. It’s really extraordinary and informational blog such a good thinking.It's a a great and useful piece of information. I'm glad you have shared this helpful information with us. Please keep us up to date like this. Thank you for sharing. Thanks for your helpful article really appreciate it!